The 3M High Flow Series Replacement Cartridge, Model HF95-S provides consistent quality water by reducing particulate, chlorine taste and odor, and scale. Our Sanitary Quick Change (SQC) encapsulated design allows for easy cartridge change-outs without the need for a filter wrench. 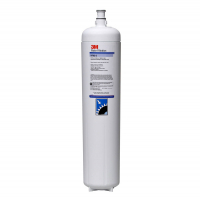 Our 3M High Flow Series Replacement Cartridge, Model HF95-S provides consistent quality water by reducing particulate, chlorine taste and odor, and scale. Excess particulate can cause abrasion and short life on pumps, seals, o-rings, and valves, while excess chlorine can cause unpleasant-tasting beverages. Scale inhibition helps to prevent the potentially harmful effects of scale build-up on equipment. Integrated Membrane Pre-Activated Carbon Technology ("I.M.P.A.C.T.") filtration media combines a membrane with a premium activated carbon block to help provide excellent throughput and cartridge life. Our Sanitary Quick Change (SQC) encapsulated design allows for fast and easy cartridge change-outs without the need for a filter wrench. Recipe Quality Water: Having cleaner and clearer water for your business is both a pleasure and a reassurance that you're giving your customers recipe quality water. With a water filtration system from 3M Purification, you can provide filtered water that may help protect your equipment and your profits. Dimension: 28" H. x 4-7/8" Dia.